Once again the crew at Three D6 perfectly accommodated the group of Kings of War enthusiasts and Matt delivered yet another perfectly organized event. This time, as we were testing a new scoring system, he prepared scenario sheets with rules explaining not only how the scenario works but also how it is scored. It helped a lot and players didn't have to spend time to calculate the scores as the three-step procedure was really easy to follow. We had 12 players this time which is also a nice attendance number. The interesting I observed, however, that every time I participate in the event there are players who did not necessarily participated in previous tournaments. It simply means that the number of Kings of War players in Canberra is much larger than and that is awesome! I am sure that the regularly organized Valley of Kings series of events helped in fueling the enthusiasm and kept people interested in this game. I had great 5 games and it would not have been possible without my fantastic opponents. My thanks to Mark (congratulations on the 2nd overall! ), Damian, Chris, Sean and Craig (congratulations on 3rd overall!) for great games! As always I would like to share my observations about the vent itself. I must say that 1200 size games are great. One does not lose anything from the experience of larger battles but can be much more preferable to introduce new players to the game. Or allow testing new armies or concepts without investing that much time as 2000 army may require. Smaller table was an interesting change for me too and I noticed that the army can still use speed and maneuverability in order to win the battles. These are also quicker which may be of an advantage as well. It is possible to finish the game much earlier or simply play more games! Thanks to that I could play more scenarios and as these are randomized from the group of 12 then I had a better chance to get accustomed to the scenarios I have not played yet - such as Eliminate. At the same time armies had enough elements to compete even after some losses. Which is good because one does not want to be put at such a huge disadvantage even if mistakes happen. The new scoring system attracted quite a lot of attention in some social media as the organizers and system authors decided to post the rules for it before the event. I made a few assumptions in order to be able to test it during the games. First, I didn't want to tailor my army to be better prepared. In fact, I am not yet sure how would I need to do it. In my opinion if I took the same or similar army to what I have has been using lately, I would get a better set of observations. Because the army list variable is removed from the equation and that would allow me to identify if I made any decisions differently. Second, I didn't want to discuss pros and cons of the new scoring system prior to the event. I simply needed to play with it and get practical knowledge to form the opinion. In general, I was not against it and my only concern was that it may require more time to calculate the results. Third, I wanted to focus on specific feedback the authors were looking for. For example, the idea for the system is that a player should choose fulfilling the conditions for the scenario as much as possible and attrition should be a secondary choice. I can now comfortably say that in neither of my games I played differently that I imagine I would have if we used other system. However, I think this is because the way I try to use my army in the first place rather than the impact of the system. Winning the scenario is always the priority for me to achieve. Sometimes I can do it by eliminating enemy units, sometimes it is not even required. I also noticed that in some scenarios achieving the goals required killing enemy units anyway. Such as in Eliminate for example. This is not a fault of the system here at all, just an observation how the scenarios are designed. On the other hand, there were scenarios where I thought winning it at all would be a challenge enough and getting more points due to scenario bonuses the system allows would probably be taking too much risk on my side. The good example is my game 3 against Chris and his Undead in Loot. I didn't think I could have a good chance to collect 3 loot tokens while I certainly would be risking heavy losses. It was interesting, however, to play with the wider brackets for the attrition. And in some cases it probably meant a slight shift of 1 tournament point in comparison to CoK2017 scoring system. The system is not too difficult to implement but I guess one needs to see how the armies that rely on attrition do under it to have a better understanding of its impact and if it achieves what the authors hoped it would. Personally, I am happy to see I can compete under different systems and still have a chance to win in a similar fashion. 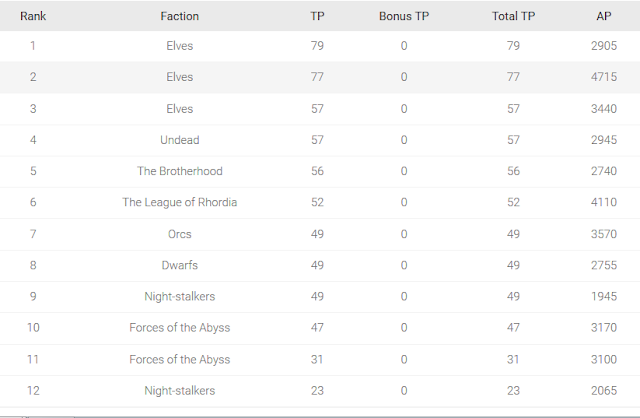 As you can see, this time Elves dominated the field and it is quite interesting result as all 3 armies were different from each other. Even if there were some similar elements in each of them. Well, I can finally reveal that I actually won the tournament! It is the first time I did so in Kings of War and I really happy about it. :) In fact, I have never won all games in the tournament before! That is a huge achievement for me, regardless of the results. I still made mistakes in the games but I think it is just part of it and while I hope to make fewer of them it may still be a difficult goal to achieve. I had some luck too because the mistakes did not result in me losing games and dice were kind to me. I am eager to continue playing with the same army because I get motivated to paint more (even if I do it at a very slow pace) and by sticking to the same list I can actually achieve the goal - which is to replace old units with newly painted ones and had properly based and painted army for Kings of War. But it is not yet the end of the season and I have another announcement to make. I have just qualified to Australian Masters. It is a tournament where top 12 players would compete to be the supreme champion and it is a great honor for me to be among them! The event will take place on 3rd December. Not much time to prepare left! I will do my best to post something about the army lists as the players have to submit them until 17th November. I will also add more about the way the tournament is organized. Until then and thanks for reading! Congrats on the first place finish which is an incredible accomplishment. I️ can’t wait to read whatever you decide to write as a lead up to the masters, as well as the write ups from the games themselves. I’m sure you’ll do the MSU style proud! I’m not doing a full version of MSU, but I’m definitely using some elements of it in my approach. At the tournament I️ came back from, I️ had 12 units in 1850 and only used one horde. I️ ended up 6th overall out of 24 (6th in battle, 3rd in paint and 6th in sportsmanship) and if you remove the cap the tournament placed on painting and sportsmanship, I️ believe I️ would be tied for 4th which is my best KoW finish to date! Not to mention, many of the 24 at the event have already qualified or are in the running for the American masters! I️ have definitely learned from your application of MSU, so many thanks for your detailed reports as they are a valuable resource. I am very glad to know that you developed your own army! While it is very flattering to hear my reports were helpful, you created the army that you know how to use and that shows! Having a list that you like to play with and you win more often than not is one of the best things in this hobby to achieve. Fantastic! Many thanks for your kind words too. I will definitely post the army lists as they are to be published by 17th November. I will also explain a bit about the format as there is one quite interesting thing about Masters. I am very happy I will attend because I expect to learn a lot from the best players in the country. It will be quite a test for me and my army for sure! Stay tuned!